Dylan is a 12-year-old boy who strives to become a professional jockey. One of his first races was the Glenbeigh Races, a prestigious grassroots horse racing event in Glenbeigh, a rural southwestern area of Ireland. 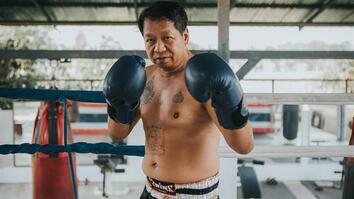 His training involves boxing, and his inspiration is supplemented by quotes from Rocky IV. Because he's such a lightweight, he has to add five stone (70 pounds) of lead in his saddle to give him a better control of his horse. This short documentary by Just So London follows Dylan while he trains to be the best against "bigger and stronger, and taller and older" boys, and how he's "going to be something serious in the making." Read a Q&A with director Jonny Madderson.